Roelofs/Eijkhout Dethrone Defending Champs at 2015 Dutch Pair Go Championships: The Dutch Pair Go Championships took place in the city of Eindhoven on November 15 this year. Ten pairs from all over the country gathered to have fun together and compete for the title. Four rounds were played to determine the winner, with 45 minutes on the clock and no overtime. Under such time pressure, good teamwork was essential to guide the games in the right direction, with enough time to spare for the endgame. The great thing about Pair Go is its unpredictability – surprising things happen all the time – and on several occasions sudden laughter during a match drew the attention of all the others. In the fourth and last round, defending champions Karen Pleit 2k & Willem-Koen Pomstra 5d faced Yvonne Roelofs 4k & Michiel Eijkhout 6d (right), whose strong effort won them the 2015 championship. Pleit/Pomstra shared second/third place with newcomers Justyna Kleczar 2k and Kim Ouweleen 4d (left), with the exact same amount of SOS points. Marika Dubiel 2d & Alexander Eerbeek 5d, another young pair, also scored 3/4 but ended on fourth place due to SOS. Complete results can be found here. Geert Groenen Wins Brabants Go Tournament: At the same location as the Pair Go Championships, another tournament took place that weekend. A total of exactly 50 players participated in the main tournament in community center Bellefort. 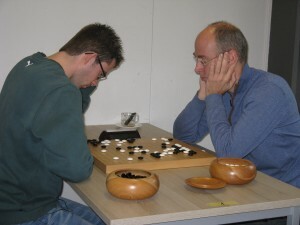 Geert Groenen 6d (right, playing Alexander Eerbeek 5d) took the title, with Frank Janssen 6d trailing in second place. Surprisingly, these two titans did not play each other in the tournament. Rudi Verhagen 4d however played against both, managed to win against Frank Janssen, and took third place. Verhagen has the distinction of having played more go tournaments than any Dutch player ever, with the magic number of 324 tournament appearances so far. Complete results can be found here. News from Go shop Het Paard, Amsterdam: A new book is available in Kiseido’s “Mastering the Basics” series. 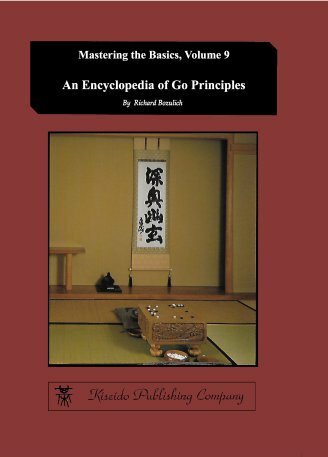 K79 An Encyclopedia of Go Principles is a compilation of the most important principles of strategy and tactics in go. These are explained through proverbs, such as: do not attack with your thickness, defend before attacking, the tortoise shell is worth 60 points, etc. Other important concepts that do not have sayings, are also included in this book, like: be willing to transfer a moyo from one part of the board to another. A must-have for players who wish to grow in their fundamentals of the game. Price: € 21,00; order here.